At Corey's Bootery we carry a wide variety of Men's and Women's diabetic shoes including P.W. Minor, Drew, Apex and Orthofeet brand shoes. Diabetic footwear is an area of our expertise, with many styles and options to choose from we are able to provide you with a properly fitting, fashionable, comfortable shoe. We have 4 ABC certified pedorthist who are able to evaluate and recommend the footwear that will work best for you. Over 50% of all lower limb amputations are due to improperly fit shoes. The commonly overlooked callus is a major concern for any person suffering from the effects of diabetes. Constant numbness & possible burning sensations cause these calluses to progress into ulcerations. This is extremely common due to the effects of neuropathy. 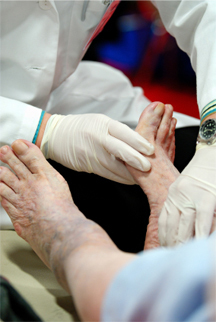 Neuropathy causes the nerves to lose their ability to tell the brain what is being senced in the feet. This give the ability for a common callus to go unmonitored and progress into a sore. This is similar to that of a pressure sore. Continued pressure and friction against the skin results in first a callus and commonly an ulceration due to the inablilty to feel and possibly inspect their feet on a daily basis. Corey's Bootery has extensive knowledge in the diabetic foot and the implications that diabetes is known to cause in the lower extremities. Corey's Bootery's Certified Pedorthist's inspect each patients foot to look for these problems, and aid in the treatment and prevention of these possible ulcerationns. Corey's Bootery's employees are dedicated to solving foot issues associated with diabetes, along with proventing them. Corey's Bootery's selection of diabetic shoes are hand picked by our head Certified Pedorthist. Each shoe is hand selected due to its function and ability to treat and or prevent pathologies of the diabetic foot. Corey's Bootery's selection of diabetic shoes enables one of our board Certified Pedorthists to find you a shoe that promotes good foot health, and fashion. Fashion is a large part of treatment, our Pedorthists realize that a shoe that is not worn does no good. Every diabetic shoe is choosen with that in mind. The Pedorthists at Corey's Bootery are dedicated to helping you choose a medicare approven shoe that fits the look and function that is needed to protect your feet from possible ulceration or amputation. Please be reminded that if you qualify for the Shoes, Medicare will also allow you 3 pair of Custom diabetic insoles once per calendar year. On the day of your choosing or appointment the Pedorthist will evaluate your feet and take impressions to create these custom made inserts to prevent and treat these symptoms of the diabetic foot. These inserts provide preventive care for the Diabetic foot throughout the year. Prevent yourself from suffering through the possible problems that are caused by the effects of diabetes and your feet. Please click on the link provided to print out a copy of the Diabetic Shoe Form. Take this to your Primary Care Physicain to be signed, and please be reminded that you will still need a prescription. Are you looking for a diabetic doctor or more information on the effects of diabetes?